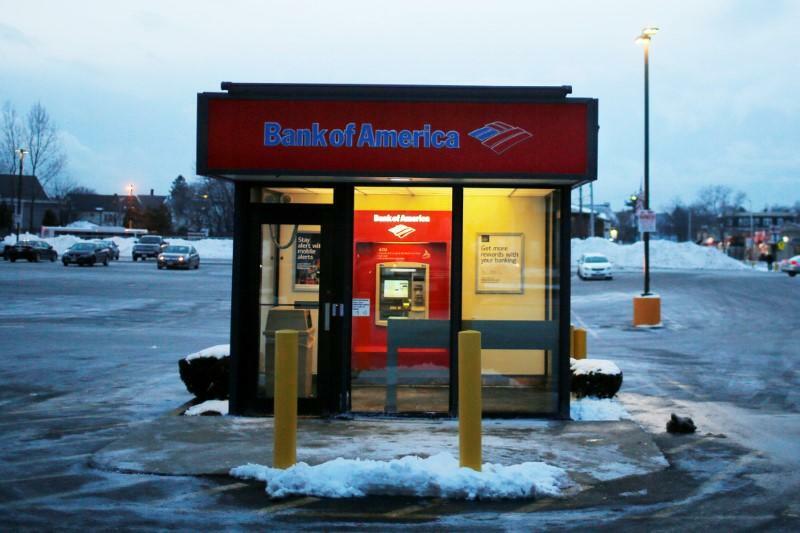 (Reuters) - Bank of America Corp (BAC.N) reported a near-50-percent jump in fourth-quarter profit on Friday due to cost cuts and higher trading revenue, and its finance chief forecast sturdy income growth ahead thanks to rising interest rates. The Charlotte, N.C.-based lender's earnings surged 47 percent in the quarter through Dec. 31 to $4.34 billion, or 40 cents a share, from $2.95 billion, or 27 cents a share, a year earlier. Excluding items, the bank earned 42 cents per share, beating analysts' average estimate of 38 cents, according to Thomson Reuters I/B/E/S. Although Bank of America's overall revenue grew just 2 percent, its non-interest expenses fell 6 percent, thanks to an aggressive cost-cutting program that Chief Executive Brian Moynihan put in place last year. It aims to cut $5 billion from annual operating expenses by 2018. Chief Financial Officer Paul Donofrio cited cost cuts as a driver of the results. During an earnings call with journalists, he also predicted the bank would produce an additional $600 million in net interest income during the first quarter of 2017 due to higher interest rates. Bank of America is considered to be the most sensitive to interest rate moves among major U.S. banks because of how its balance sheet is comprised. It was the first big U.S. bank to report earnings since the Federal Reserve raised interest rates for only the second time since 2006 on Dec. 14, with JPMorgan Chase & Co (JPM.N) and Wells Fargo & Co (WFC.N) also reporting on Friday morning. Analysts have criticized Bank of America, the second largest U.S. lender by assets, for being slow to trim costs. Although cost cuts helped earnings last quarter, the bank still may not have gone far enough to satisfy investors. Its efficiency ratio, a closely watched measure of revenue divided by expenses, was 65.1 percent, compared to a Barclays estimate of 62.9 percent. Donofrio said the bank was trying to get to a ratio of 60 percent. The bank also indicated first-quarter expenses would be elevated by about $1.3 billion due to retirement-related compensation costs for employees and higher payroll taxes. Trading was a highlight for Bank of America in terms of revenue. The business benefited from more client activity in the fourth quarter, as bond-market volumes picked up significantly and U.S. stocks soared following the presidential election in November. Its revenue from sales and trading, excluding special items, rose 11 percent to $2.9 billion from $2.6 billion. The bank's shares were little changed in premarket trading, having risen 34.8 percent since the election. U.S. bank stocks have rallied strongly since President-elect Donald Trump's victory, in anticipation that his policies will boost the economy and loosen regulations that have hurt bank profits in recent years.